Quality Meat Scotland (QMS) is rolling-out a new Scotch Lamb campaign which builds on the success of the ‘Scotch Lamb, buy local’ campaign developed last year. The four week campaign, which aims to reach 88.9% of the target market in Scotland, features print advertising as well as digital display panels in Glasgow Underground. The activity also includes an on-line TV advert plus a presence on key cooking and recipe websites. 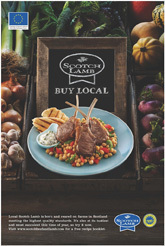 “The ‘Buy local’ campaign is aimed at encouraging consumers to buy Scotch Lamb when it’s at its most plentiful,” said Suzie Carlaw, marketing controller, QMS. “Scotch Lamb stands out from its competitors because of its unique taste, plus the fact, it’s a natural product which is born and reared on farms in Scotland meeting the highest quality standards. QMS-commissioned research which was carried out by IGD, reveals that Scottish consumer recognition in Scottish target markets of the Scotch Lamb brand is already strong at 85%. More than half of Scots (62%) surveyed in October 2011 rate Scotch Lamb as the “best available” and 74% agree that it is produced with “higher standards”. Additionally, around 52% of target markets surveyed agree they are willing to pay more for Scotch Lamb. “The research figures are very encouraging and high consumer awareness is a great foundation to build on,” said Carlaw.